Inventory control forms can dramatically help you keep accurate records of items and products you have on hand. These easy-to-use forms can be downloaded and printed instantly off this page for free. Continue reading below to see how the Microsoft inventory control forms can immediately benefit your business today! 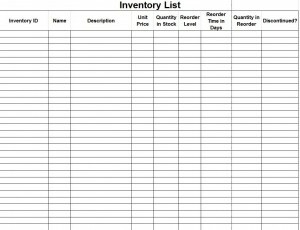 The inventory control forms featured here are available in the form of a Microsoft Excel spreadsheet. However, the form can also be changed to a Word document or PDF file if you so prefer. The inventory control forms are very basic in appearance, but you can easily add color or a company logo. There are infinite customization options available with Excel. After you’ve downloaded the template and looked it over, be sure to save an unused blank copy. The first step in filling out the inventory control forms is adding the inventory ID number, followed by the name and a brief description of the item. Next, add the unit price, followed by the quantity in stock. You will then determine at what level the item will need to be reordered, as well as how long it will take to receive the item once an order has been placed. Then place the total number of items that have been reordered. If an item has been discontinued, note it in the appropriate category. You can fill in the inventory control forms either directly with your keyboard or by hand. The template contains few formulas so it can easily be printed. Download the Microsoft Inventory Control Forms Free Today! Inventory control is a critical aspect of business that must be addressed. You’ll never have any issues keeping inventory again with these Microsoft inventory control forms. Download, Dave and print the Microsoft inventory control forms for free here at MyExcelTemplates.com today! Your articles on INVENTORY are very interesting!